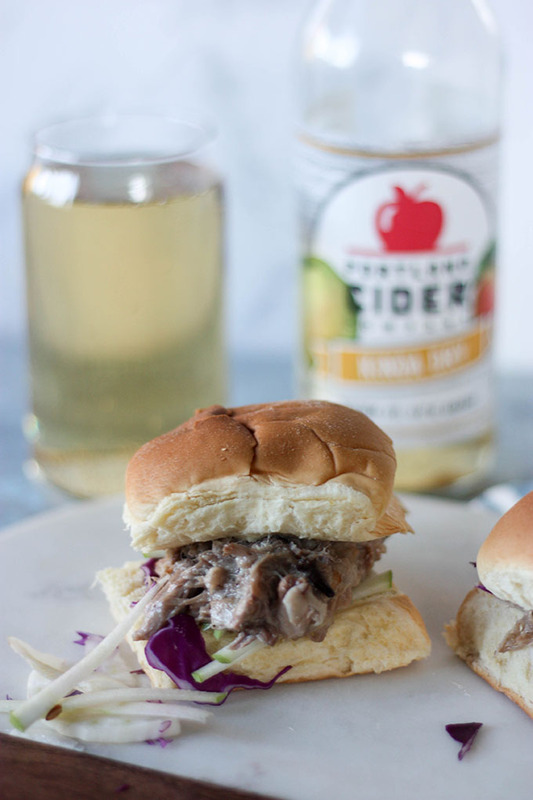 These apple cider pulled pork sliders are everything you need for your next fall party! A mix of dry apple cider, warming spices, fresh apple, these sliders are the perfect party or for game day! Thank you to Portland Cider Company for providing me with the product for this post. As always, all my opinions are my own. Thank you for supporting the brands that make THCK possible! I think I’m going to keep this post short and sweet, because to be honest, my brain is beyond functioning correctly and I am severely deprived of sleep! I keep doing that thing, where I go into the kitchen for something, and completely forget why I’m in there. Or leave my beer on a table, only to have forgotten where I’ve put it. 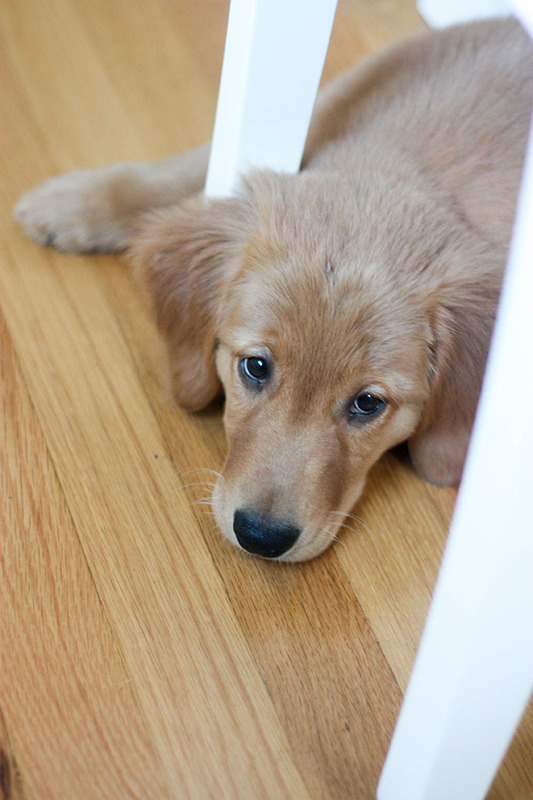 Due to a certain little golden fluffball nugget that joined our family last week! But in all seriousness, sleep deprived and all, we would not change it for the world! Archie has made immense progress in the last week. He’s settled down so well, is learning new tricks and commands (he can sit, come and lay down…proud parent moment), is attempting to learn how to walk on his lead, and is pretty much getting the hang of crate and toilet training. This little doggo has completely changed our lives, but 100% for the better! Now, I don’t want all my posts to be about Archie, but right now, I can’t help feeling just really happy and proud to be his dog mum! Ha ha, it’s started already! 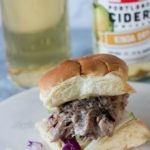 Moving on to these apple cider pulled pork sliders! OMG these are, like, so good. You won’t believe it. I’m actually rather proud of myself branching out and trying something new! I realised I rarely post main meals especially meat meals. While I eat meat at home, I still have this fear or photographing meat. It can be so difficult! But I’m branching out and doing something different! And it feels good! A while back I was given some product off Portland Cider, a Portland based cider company and have developed a couple of recipes for them (here & here)! This is the first time I’ve done a savoury recipe and I’m so happy about how it turned out! 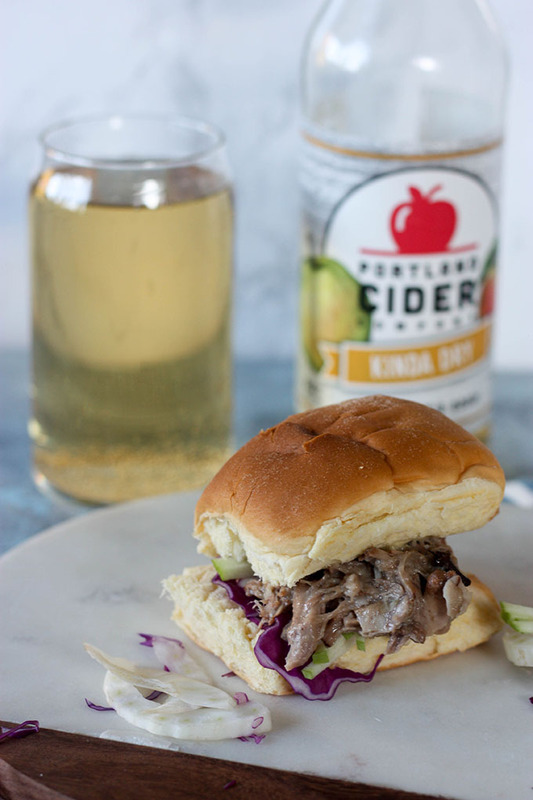 The base for this recipe is a 2lb pork shoulder, slow cooked in Portland ciders dry cider, a bunch of different spices, and some fresh apples and orange juice for extra flavour! To add to the flavour of this recipe, the leftover juice is then whipped up into a thick and creamy gravy which is absolutely mouth-watering! Complete the whole kaboodle with a soft Hawaiian roll, and a crunchy coleslaw. Easy and flavourful, this recipe is perfect for a cozy week night meal, or your next game day get together! 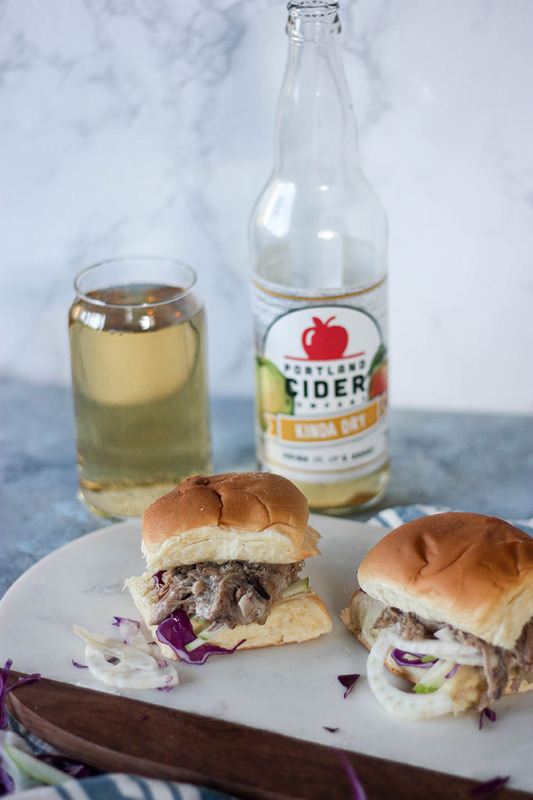 These apple cider pulled pork sliders are perfect for a party or your next game day with friends! Place pork, cider, brown sugar, spices, orange, apple, sugar and onion into a slow cooker. Cook high for 4 hours, or low for 8 hours (note 1). Once cooked, remove pork shoulder and shred using two forks. Stir over medium to high heat, until thickened and lumps have gone. He’s was looking longingly at this recipe before settling beside me asleep, occasionally giving me the side eye. Oh man! Puppy sleep deprivation sounds awfully similar to new baby sleep deprivation. I remember giving my toddler chicken stock instead of juice once because I was so out of it haha. These sliders would have pulled me out of my funk!! YUM! Perfect for fall!! Archie’s face kills me! He is so sweet :). Isn’t it amazing how they can turn our lives completely upside-down and we don’t even care? Dogs are just the best! I LOVE the sound of these sliders. They sound perfect for a fall party! ha ha I never knew just how much time he would take up! I love him but I did have a meltdown the other day because I was SO tired!! he is the sweetest little thing and is really starting to learn! wouldn’t it be awesome if archie and cookie could have a play date! First of all, congratulations on the puppy. He is freaking adorable! Second, how cool you are from Portland, too! I love the PNW, we’ve been here almost 3 years (I think). Third, I feel compelled to tell you my maiden name was Georgi. I’m guessing that means we’re best friends now. Forth, and most importantly, your recipe sounds so damn mouthwatering! I love pulled pork sandwiches so I’m def pinning this for later! I love how dogs bring so much joy to our lives, that we overlook all these little things that could stress us so much otherwise! Archie is such a darling :). I am a vegetarian, but I do cook with chicken and meats occasionally. This recipe sounds wonderful with so many amazing and yummy flavors..The best for me is the orange! Can imagine how delicious those sliders are! Thanks Deepika! Archie is certainly keeping us very busy but he is just the best thing for our lifestyle and our wellbeing! This recipe is fantastic, the flavours mesh so well together!